A few days ago my sweet friend Bev emailed to tell me there was a challenge which was right up my alley and that I must enter. 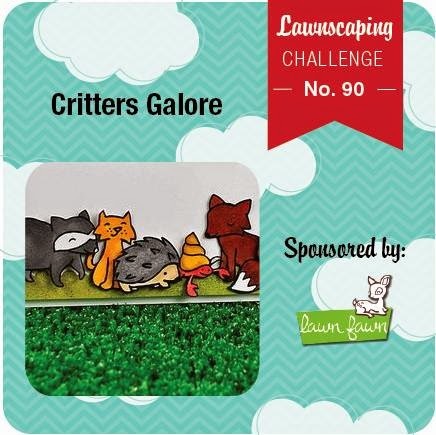 The challenge in question was “Critters Galore” at the Lawnscaping Challenge blog. Bev was right – this is right up my alley. I haven’t entered a Lawnscaping Challenge before but I can’t help but jump right in. I have so many ideas for this challenge because, as you all know, I love creating with Lawn Fawn stamps, especially their critters. Materials used: Stamps – Critters in the Arctic, Joy to the Woods (Lawn Fawn); Dies – Lawn Cuts – Stitched Hillside Border (Lawn Fawn), Die-namics Blueprints 5 (My Favourite Things); Designer Paper – Hello Sunshine 6×6 Paper Pad (Lawn Fawn); Cardstock – Unknown, American Crafts; Copic Markers, Mister Huey’s Color Mists – Opaque White (Studio Calico); Glossy Accents and Wink of Stella. And there we have it! My first entry into the Lawnscaping Challenge Blog. Thanks for the heads-up, Bev! Yayyy…you’ve shared your magic with LF with a wide audience and they will love and adore this just as much as I do…which is oodles upon oodles! Mr. Moose may be moose-partner-less now, but with that handsome coat, stylish set of antlers, and triple hearts a pitter-pattering, it won’t be for long. The call of the wild will be heard *grin* I’m with Bev: Winner, winner!!! Wonderful card! Such a beautiful wintery scene. I think this card is a winner!! More in the works??? Hope so! YAY!!!!! I knew you’d make something perfectly enchanting for this challenge!!! 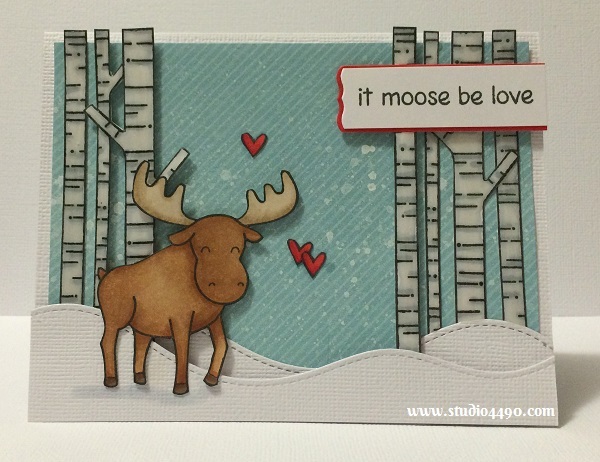 I totally LOVE this sweet little moose card. You’ve nailed this challenge for sure girlfriend. Perfect design, perfect colors, perfectly falling snow, perfect coloring, perfect card!! As Geri G. would say; “winner, winner, chicken dinner!!! !” Woohoo!